Watching world events lately one cannot help but to wonder, whatever happened to the war in Afghanistan? Are U.S. soldiers supposedly still exchanging fire with Al Qaeda as (supposed) payback for 9/11? For a couple years I had been offering cash reward for anyone who can prove the war in Afghanistan to be a real "war" scenario, you know, the one with the video proof of the opposition actually firing back at our positions. That's right, for years I offered a cash reward for anyone who can prove that there is a real conventional war (like the Vietnam footage) going on in Afghanistan. Challengers needed only to show actual video footage of U.S. tank and artillery positions in place and firing on the enemy (Al Qaeda), then gather some concrete evidence (meaning video footage) of the Al Qaeda military resistance. What military resistance? The one that justifies the U.S. military's long stay in Afghanistan. To this day I'm not aware of any video evidence showing Al Qaeda's tanks and artillery firing back at U.S. positions (ie proof of an actual war). The mainstream media has never produced evidence that would make a reasonable person logically deduct that there is an actual war going on in Afghanistan. Not video of U.S. military blowing up an building or a "target" but an actual war with two participants firing on each other. Even Fox News reported years ago that the U.S. was "helping" grow Opium in Afghanistan all the while no one has ever produced evidence of any actual war. Incredibly, despite years of evidence proving that there has never been any war (but instead an occupation) in Afghanistan, mainstream-media-watching Americans have blindly believed and accepted that somehow the world's most powerful military (the U.S.) has been in an equally-matched war against the dangerous and powerful Al Qaeda military forces thus rationalizing and justifying this long "war" and occupation in Afghanistan. 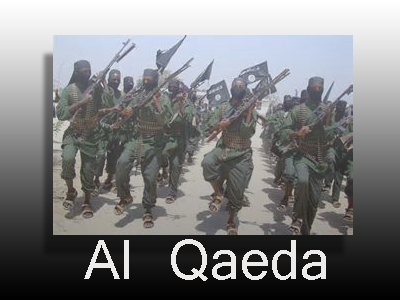 As the ridiculous ISIS script continues to play out in what I consider to be a psychological operation on Americans and the world, and as we now see ISIS tagged as the new military might to compete with the U.S. military, the question has to be asked: Where is Al Qaeda? What is Al Qaeda doing? We know that ISIS was originally named "Al Qaeda in Iraq", does that mean that members of Al Qaeda made a deal with the U.S. to fly to Iraq, created an Iraqi movement then switch their names to ISIL or ISIS? If so, how many Al Qaeda members switched groups? Is there any difference at all or just the location? How about the war in Afghanistan, which members of Al Qaeda are still fighting there?? Where is Al Qaeda and how come they are no longer in the news? The origins of ISIS is fully exposed to anyone who is awakened but what should we say about the official status of Al Qaeda? Or should I say, what would the establishment (and its mainstream media) have us believe about the 2014 current and official status of Al Qaeda? Is there room for logic and reason any more in this crazy geo-political new world order scheme or should we all just accept all this craziness without asking simple questions? Notice I said simple questions not critical questions because the questions we are asking are not trick questions or questions or forensics or science, they are simple straight forward questions. Where is Al Qaeda now? Do they no longer exist? If so, then when did they ceases to exist and why is the "war" in Afghanistan still going on? As the recent ISIS psychological operation on humanity rolls along, we (humanity) have to stop to ask these simple questions because these simple questions are the very things that will continue to expose the globalist criminals. Here's some questions: Why has Al Qaeda never attacked Israel? Why do our politician's stated goals always seem to fit in nicely with Al Qaeda and ISIS? Can anyone present a shred of evidence that proves that Al Qaeda is not ISIS? Hey if ISIS acting alone would it be possible for ISIS to attack Al Qaeda or vice versa? How does Israel avoid having to deal with attacks from both of these groups? As long as we (humanity) feel that there is something worth fighting for we have an obligation to expose all this political theater, propaganda and monkey business being imposed on humanity. Sadly many Americans will never attempt to answer even one of these questions and instead label these questions as nonsense, conspiracies, even anti government propaganda. Sadly too many Americans who are now deeply entrenched in the ISIS psychological operation won't ever get beyond what CNN or Fox News and Sean Hannity tells them. Everything else is simply conspiracies. No thinking, no reasoning, no asking simple questions, no logic, no true journalism, no real reporting, nothing. Digging and poking at the Al Qaeda psyop is one way to expose the ISIS psyop since it came first. Unfortunately our government has control freaks who believe in imposing mass mind-control operations in order to control the masses with fear and it is up to us to find creative and interesting ways to expose their lies and deceit. So today I want to know what did Al Qaeda do yesterday, where are they and why are they no longer being mentioned as a threat by the U.S. western media WHILE the "war" in Afghanistan continues year after year. By the way, has anyone seen the video evidence of ISIS overcoming the Iraqi army? How about the recent battles claimed by mainstream media, has anyone seen actual evidence of ISIS firing U.S. tanks and artillery weapons? Where are these videos? And by the way, who trained ISIS to fire our tanks and howitzers? Remember that having the weapons is not enough, you must learn how to use the weapons as well. U.S military cannoneers train to fire Howitzers for almost two months. Who trained ISIS on how to fire U.S. military weapons? Alternatively we should be asking, when will Americans as a whole have enough of this nonsense? When will we pull together to turn justice on the globalist and their phony patsy terror groups that change names all the time and always end up with U.S. weapons? When will humanity pull it together and see that coincidentally none of these engineered terror groups ever attack Israel yet they always seem to want to get their hands on U.S. civilians who are not part of their war? There are no accounts of any direct full military battles against U.S. military and even now that the globalist are scripting this recent military battle against ISIS in Syria (as they did with Al Qaeda and Taliban in Afghanistan) we are being fed stories and reports from mainstream media sources without and real evidence of a war going on. Al Qaeda has supposedly challenged the U.S. military to the tune of a 13 year war and still counting while naive and dumbed-down Americans blindly accept these bizarre statistics while consumed in sports and entertainment. Now ISIS is supposedly withstanding air strikes with ease yet we are not told how they are doing it. ISIS even has the ability to embarrass the U.S. by showing up to the battlefield with sufficient ammunition all the while the U.S. runs out of bullets. Imagine that, remember we're talking the worlds greatest military here. The fact of the matter here is that many of us have personally had enough of the ISIS psychological operation and we're reminded (literally by an Al Qaeda commander here) that Al Qaeda is (was?) no different. The difference is that much more of humanity is awakened to the globalist plans and we are determined to fight back against these destructive psychological terror scripts imposed on us. Life is too precious to have to deal with "ISIS" or "Al Qaeda" or any Intelligence synthetic terror groups. We can't afford to have a staged elimination of terrorism (Bin Laden death hoax) only to have a brand new terror organization conveniently funded and armed by the U.S., Israel and its Middle East buddies to wreck havoc on humanity while giving a pass to its creators. I say let us roll with the ISIS operation like a good martial artist and use their ISIS psyop against them. Let's all keep pushing to expose this ISIS agenda and hope for something to crack. The globalist agenda must crack, and it will crack. It is up to each and every one of us to see to it that the plan cracks. One way to help crack this plan is by sharing this message with someone, staying strong, keeping your mind clear, your eyes wide open and continue to view our current day narratives in the context of history and known facts instead of the context of CIA controlled mainstream media guided emotion and propaganda.